For the GST launch, the government has invited all Members of Parliament and chief ministers and has requested former Prime Ministers Dr Manmohan Singh and HD Deve Gowda to join PM Modi and the President at the high table. While the Congress wants the President to launch the GST, Trinamool Congress will skip the event. Mamata Banerjee has confirmed that her Trinamool Congress will skip the government's mega midnight launch of the Goods and Services Tax (GST) this Friday. The Congress, which has been dithering for days, is yet to say no, but today objected to the invitation, which says that Prime Minister Narendra Modi will launch the biggest tax reform in India's history. The President must do the honours, the main opposition party argues. "How can the Prime Minister launch GST in the presence of the President? This is not done and acceptable," said Congress spokesperson Randeep Surjewala. The invite, sent by Parliamentary Affairs Minister Ananth Kumar for the function in Parliament's Central Hall, says PM Modi will launch GST in the presence of President Pranab Mukherjee. 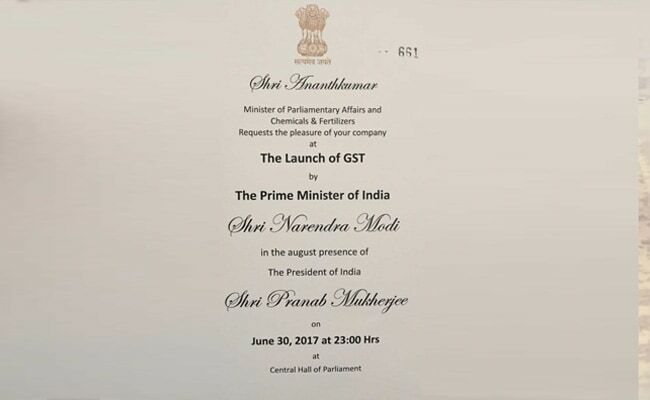 The invite for GST launch was sent out by Union Minister Ananth Kumar. Mr Surjewala also suggested that the government consider requests to delay the launch of GST in view of protests by textile traders and others. "They can't have the arrogance of numbers and not listen to small traders and weavers," he said. Mamata Banerjee, who is West Bengal chief minster, said her party will not attend the launch, saying in a Facebook post that the "unnecessary hurry to roll out GST is another epic blunder of the Centre." Yesterday, her finance minister Amit Mitra had requested the Centre to delay the launch as small businesses are not prepared for the big transition to a unified tax across the country. The Left's Sitaram Yechury, who had earlier this week confirmed that his party would attend the government's function to launch GST, asked today, "why the hurry." The government has invited all Members of Parliament and chief ministers and has requested former Prime Ministers Dr Manmohan Singh of the Congress and HD Deve Gowda of the Janata Dal (Secular) to join PM Modi and the President at the high table. Dr Singh is yet to confirm his participation, as is the rest of his party. Congress sources have said that a final call will be taken after party chief Sonia Gandhi consults leaders. But much of the opposition is expected to stay away or send token representation. "This is only a meeting, not a Parliament session and our presence is not really required," said a senior opposition leader. The government has repeatedly pointed out that every GST rule has been designed and frozen by the all-powerful GST council, where state finance ministers of states ruled by the Congress and other opposition parties have represent their parties' views. It is firm on rolling out GST, which replaces a slew of indirect taxes on goods and services, on July 1 as planned and has gone all out to make it a grand launch. The historic central hall will be lit up and decorated. The function will begin at 11 pm on Friday and both PM Modi and President Mukherjee will speak on the occasion.